Ebonie was diagnosed with a germ cell tumour back in June 2014. We found a small bruise on her bum that didn’t seem to go away, and after several tests and a biopsy it was confirmed that Ebs had a tumour growing on her lower spine. It was a solid mass and was growing rapidly day by day and had already spread to her lungs, putting Ebs in the high risk category. Following diagnosis, Ebonie underwent six rounds of chemo which immediately shrunk the tumour, enabling it to be removed through surgery in January 2015. The surgery was a great success, however there were still cancerous cells active in her lungs. These proved to be tricky to treat- the 2nd line chemo Ebs was placed on wasn’t working, so it was decided a 3rd line chemo would be used. This chemo was rarely used in children and hadn’t been used at Great Ormond Street in over five years. The chemo had a very high ethanol content too – meaning as it was infused Ebs would actually get drunk! After 3rd line chemo Ebs was able to have surgery on her lungs to move the solid masses, which took place in January 2016. This was successful and very tough on Ebs as she was a great deal of pain. Following on from the surgery, tests showed that there were still active cells in her body, but we couldn’t find where. Therefore it was decided that Ebonie would have to have high dose chemotherapy. This comprises of 2 chemo drugs that were previously successful, but in a much higher dose. For this to happen Ebs had to have a stem cell harvest- this is the collection of her own stem cells, which are given back to her following high dose chemo, so her body is able to reproduce its cells as the chemo kills them off. As it stands, Ebs has just finished her first of two rounds of high dose chemo. She is in hospital in isolation for around four months, but possibly longer. This is the fifth different type of chemo on her little body and the more she has the harder and harder it gets for her. This is the last attempt at getting rid of the cancer, as after this we would have to move onto experimental treatment options. Since finding out our little girl was terminal in February and that we didn’t know we had long left. We knew we had to use every opportunity we would to make memories although this had to be put on hold until Ebonie had some palliative radiotherapy on her abdomen. Radiotherapy all in all went well and we had an amazing response both clinically with Ebonie and AFP-tumour monitoring. We just didn’t know how effective and for how long. Unfortunately recent reading showed that although we had a great response it was very short lived and the disease is spreading. We recently had a CT scan which has showed extensive lesions within the lungs and that cannot be radiated at all due to the risks it carries. Three days ago Ebonie started seizing at home which lead to her being hospitalised. Thankfully we seem to have it under control now and hope that we don’t have anymore episodes but we simply do not know as this was completely unexpected and not even considered as a possible symptom. Despite all of this, all the ups and downs, the sadness, the heartache, we have had no choice but to face everything head on, Ebonie has been absolutely incredible dealing with her new changes like medicine Intake, requiring oxygen throughout the day and dealing with her changes to her body. We thank everyone who are a part of Post Pals. You can be assured that you are putting a big smile on Ebonies face and distracting her with all your post being sent. With heavy hearts and tears streaming we feel it is now time to share the latest updated with you all. Wednesday last week, we were told that treatment will be stopped, that the disease has progressed too far, and that it’s very likely chemo resistant. There are no other options. Our baby girl will be forever 4, she will never get to start school this year, she will never meet or be the amazing sister she so wanted to be, and she will never grow old or have her own little family. Our family are completely heartbroken. We have been told that they don’t know how long we have left with our princess. It is now time to do as much as we can with Ebonie, tick off everything she has on her list of things to do- big and little and we would appreciate your continued support at this difficult time. We will fill our Ebonies remaining life with love and laughter like she has generously given us the past 4 years. Our days and nights are extremely difficult right now. We are trying to juggle our emotions as well as making our days as special as we can with our Ebonie, so please be patient with any replies. A lot has happened since our last update! Yes we went into GOSH on the day planned for the molecular results. Thankfully the results showed what our consultant had hoped for warranting the start of a drug that had been previously researched- this drug we don’t know how it’ll react along side the chemotherapy and also what it’ll do for our Ebonie. But, at this present time we have no other options and everything is pointing to this pathway. Unfortunately these results also showed that Ebonie has a gene which drives cancer and is seen in other types of cancers. For this gene there is no targeted therapy and we need to hope that it’ll respond to this next combination we will start. Whether this gene has been there since diagnosis or developed during treatment- we do not know. Within 3 days of starting this new drug Ebonie became very poorly, sickness, chest and tummy pains with a high temperature. Ebonie was immediately admitted into our local hospital. Baseline bloods were taken which showed a high infection marker, culture taken and a 48 hour was had for those results. During our hospital stay, the infection marker was increasing by the day, Ebonie was not herself, wasn’t doing much at all, losing weight too- she had chest X-rays and ultrasound which both showed something. After which ended up to be a 72hr wait for culture results they were negative but the infection marker was still there. The chest X-ray showed shadows- at this point we did not know if it was infection or disease progression and a chest CT would confirm this. The ultrasound showed pressure on the left kidney and an increased in tumour size- the pressure was seen as the tumour was pushing onto the kidney which explains the pain Ebonie was complaining about. We have to monitor Ebonies toxicity levels from her new drug, the results showed that Ebonies levels were high which could be the reason for some of the symptoms present but wasn’t the reason for the underlying infection marker. After many talks with our care team, it was decided Ebonie would be discharged on oral antibiotics and supplement until we were due into gosh the following week for a MRI and CT scan. The following week Ebonie was still too unwell to have a GA for the MRI, she was still coughing, very lethargic and not herself and it wasn’t worth putting her through it all. A whole week had passed and we have a CT scan, Ebonie has this without a GA so it all went ahead, a couple of days later we had a MRI under GA. The results were hard to hear. The CT showed disease progression, the known lung lesions have got bigger, there are new lesions and it looks as though calcified lesions are waking up/active. The MRI was the hard hitting results- the MRI was on the primary site pelvic area. It showed that there was an increase in size, it showed the tumour is obstructing a tube that runs from the kidney to the bladder which explains the deranged blood levels we have been getting and explains the pressure seen and inflammation. It also showed that there are ‘hot spots’ in the liver meaning it has spread to the liver. Absolutely devastated. We knew that there would be disease progression as we have been monitoring the tumour marker but we didn’t expect it to have spread to a new area. What now? We are still waiting for an in-depth meeting with our care team which is this week but as far as we know we are going to continue with the new combination and hope, hope so bad that it gets control of the progression and opens up other options. February has been a very difficult month and I want to thank Post Pals for all your support, patience and love for our little Ebonie. We tried dearly to enjoy Ebonies birthday but she was just so poorly and tired, she did though receive so many lovely cards and gifts. Ebonie may have been very tired but she enjoyed opening everything and it did put a smile on her face. Please please keep Ebonie in your thoughts and hope we get control soon. November was in all honestly a disappointing month. 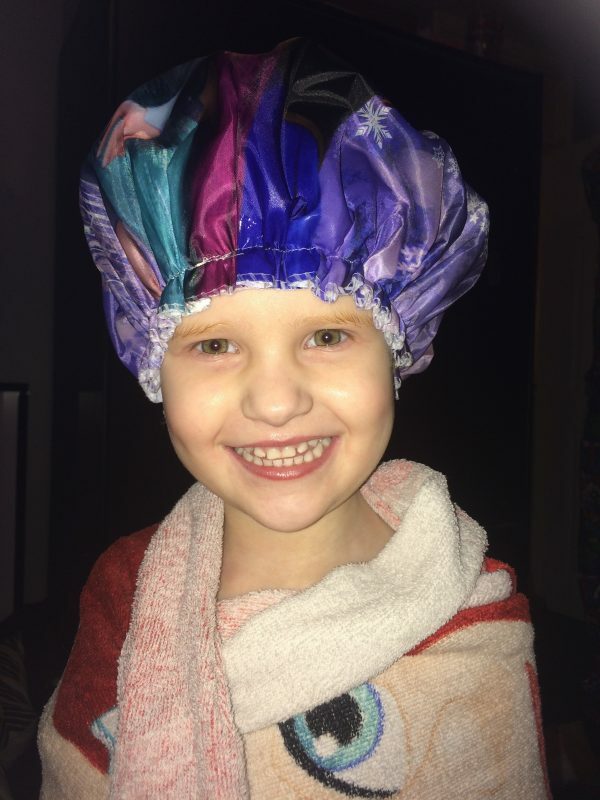 Ebonie continued with and saw her chemo schedule out. On 22/11 a port removal was requested, a procedure that so many have and one that should be straight forward – not for our Ebonie. We had the port removed as Ebonie has a double lumen line as well, that treatment can be administered through. There was uncertainty to the whole day but the removal went ahead and all was ok prior to theatre, but when she was in theatre there was a complication. The port line was embedded and couldn’t be removed the ‘normal’ way. Instead they had to make an insertion to her neck around the vessel to remove it. This was where the concerns lay as she could bleed out and have problems from here. After a careful watch and an admittance to the ward Ebonie was allowed home and on a strict recovery plan. No running or heavy lifting for two weeks. Now anyone who knows Ebonie knows this was going to be a challenge for her. After a long and horrible November, we were fortunate enough to be invited to Chessington for a Christmas weekend. It was definitely what was needed and cheered Ebonie right up. She struggled with energy but we were made to feel very special and feel very lucky to have gone! Thank you Post Pals. Heading into December and for a better month, hoping for options for our Ebonie to have future treatment didn’t exactly go to plan. As we all know, future treatment for Ebonie is unknown. We have explored all conventional treatment with the option to re-harvest previous drugs, not being an option. Ebonie’s long term 5 year survival rate is extremely low and even harder to come to terms with. At this point we are relying on a molecular analysis test to hopefully point us in the right direction – potential drugs that can be used or clinical trials that can be approached. At the beginning of December we were called to GOSH for what we thought was to get these results and discuss our options and moving forward. Unfortunately, the bad news continued to fall at our feet. The sample that was run came back as failed and the only explanation to this was a technicality problem. So unsettling and frustrating because we waited 6 weeks for this result and we know the AFP is rising. After talking this through we agreed to have another sample sent off and another to see if Ebonie fits an ongoing trial that is being run in Germany. This is our only option at this stage, but there was also two options in relation to chemo. We could leave with no chemo, knowing we have an increasing tumour and have it increase more and possibly more aggressively. Or we leave with another cycle knowing the AFP is increasing, but in the hopes the chemo will slow it down. That will give us more time and hopefully have some results back in time for when the 21 days is up. We went with the latter so left with another cycle of chemo. Throughout this cycle from the start, side effects kicked in. Ebonie’s hair was starting to fall out again, sickness, tiredness, bloating and upset tummy along with constant bad stools and mucositis. This was a constant battle and only when we managed to get new medication were we able to keep it at bay. It never settled, but it never got any more than it was with new meds. To have chemo for anyone is difficult and even more so for a little child – 21 days straight, twice a day solutions are tough. We really did see the struggle with her throughout the month. So hard and unsettling, as there was nothing we could do except comfort, support and encourage her. Once she saw the cycle out and had her week’s recovery, Ebonie, the true fighter she is, was back to herself. After this cycle we were called into GOSH on the 28th, feeling excited to get some answers for Ebonie. The Germany trial came back as negative, meaning Ebonie would not be suitable for the trial and this option was instantly ruled out. Ok, so what about the molecular analysis? It’s still yet to come back, so technically we are still none the wiser and any better off with giving Ebs a different drug. So what to do … again? Looking at the whole picture and what the AFP is doing. It seems that the chemo is now starting to have some effect. Ok, it isn’t doing what we would like, e.g. bringing the tumour marker down, but it’s hovering around the same level with each reading taken. So we agreed that it would be silly to stop the oral chemo now and it was best to go home with another cycle of oral and have until we get the molecule analysis back. 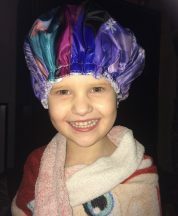 We still need something else, as with oral chemo alone it won’t be enough for Ebonie. Jan 4th and we’re on Day 6 of the chemo with a clinic appointment approaching. We hope that this is the right time for results and we will have a treatment option to follow, a different drug or to be a candidate for a clinical trial. Either way, we hope it’s the part missing to control and stop the growth to be able to explore the possibility of surgery again. Thank you to everyone who sent our Ebonie post, to all the cards and parcels, not forgetting the emails. We had such a special Christmas and thanks to Post Pals we had a extra day of celebrations- Christmas Eve was a whole day of present opening because of everything sent in. We are very grateful for the Christmas we had this year. We didn’t take a minute for granted and appreciated it all. And that was all because of everyone within the Post Pals community. You made Ebonie smile ear to ear and laugh daily. Thank you. Unfortunately we have had another unpleasant and upsetting results for Ebonie. We were given the results that there is now a 4th area we are dealing with in Ebonies Lung and for this reason, radiotherapy is not an option at preset time. This is really upsetting as it is a different form of treatment and one we feel could be beneficial for Ebonie. We would be covering too much of Ebonies lungs and it not only carries a big risk because of a previous drug used but, it’s pointless targeting areas if others are going to appear after. So what now? We will continue with the oral chemotherapy until we have an option with future treatment. We hope this oral chemo will start to hold the Tumour growth and give us control then with the option to possible explore other treatment such as radiotherapy again. As Hard as it is to write, Ebonie is in a serious position. She is looking really well but the inside of her tiny body tells a different story and she is very poorly. We want to thank everyone who continues to send Ebonie letters and parcels. She loves seeing her name on the letters and it’s even more special when gets to open the door to the postman who says ‘for Ebonie C’ her face lights up, she goes all silly and says loudly ‘Thank you’- So Thankyou to everyone who helps to make this happen. August has been a very hard month for us all, especially on our Ebonie. Unfortunately the last chemotherapy Ebonie was on had to be changed, as it wasn’t working and her AFP tumour marker was increasing. This was extremely worrying, knowing we have already explored so many treatment options. Thankfully there was another regime that our consultant had in mind and that we could start. This new drug has only been used within adults and a few children. This is another harsh drug that comes with new side effects and obviously more damage to Ebonie’s tiny body. We pray that this new drug will bring Ebonie’s tumour marker down to allow for surgery. With all of this happening, Ebonie went into hospital with a spiked temperature,and culture results – taken from her double lumen Hickman line showed Ebonie had an infection in both lines. We were told it was quite a significant infection too. After two weeks of antibiotics, we have today been given the all clear and discharged from our local hospital. This month (September) Ebonie will continue with having cycles of chemotherapy along with a round of imageries. At the moment we’re hoping that this round of scans will show everything has stayed the same as the last lot and that there are is no new activity sites. Thank you so much to everyone who have sent post. We love reading all the cards and stories sent. We have received postcards from all over the word that Ebonie is collecting. It’s fascinating for us all, just to name a few are from Singapore, Australia, New Zealand, America and Germany. There are many more too. Ebonie is now on recovery from the chemotherapy she had last week and as always in my eyes, doing fantastic. She makes us all very proud. Thank you to you all, we are so grateful that you think of our Ebonie and put so many magical smiles on her face. After eagerly waiting for the plan, Ebonie has now started chemotherapy again. We are hoping it will only be two cycles which will last a total of 8 weeks, and that it will be enough for a surgical resection with minimal risks. Thank you to everyone who has sent Ebonie post, for the gifts, the letters, the stories and cards. We are truly grateful. Ebonie runs to the door every morning to collect the post. She will sit and listen to everything read to her, it has opened a whole world of imagination, excitement and questions. Thank you so much for allowing Ebonie to be a part of post pals. To say we are thrilled with all the support so far, is a bit of an understatement. We have received so many letters and a few gifts so far. We’ve kept the return address’ to try our best with sending thank you’s. Actually Ebonie enjoys doing stuff like that, it helps to pass time. She hasn’t opened it all yet, GOSH called me and asked for me to collect Ebonie’s deliveries, as she had so many. We had two boxes and a whole bag filled with cards and letters. The assumption was to head back in for the second stem cell this week, as Ebonie has done so well in the first, but it never stayed to plan. Scans showed new activity in the primary site (pelvis) and lungs, so we are awaiting the plan. They are extending treatment again, so we will have more stays as an inpatient. So for this reason we have kept it all, so she has it to open once we are in. Following Ebonie’s transplant, very sadly her cancer has returned almost straight away. Ebonie’s cancer has been detected in both her primary site and elsewhere in her body.